Have you ever wanted to learn how to use a Dutch oven? I think most of us who like outdoor cooking would enjoy new ways of cooking in the outdoors. Think about this; Squatting heavily in many dank basements, drafty attics, and dusty, cluttered garages, these three-legged hulks from a bygone era wait impatiently to release their treasures. Until then, they are pitted by time and tarnished by neglect. For those who will uncover the mystery, their gaping caverns can once again be brimming with magic. 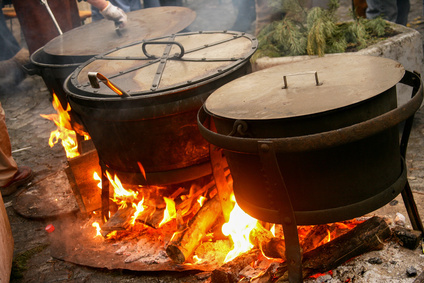 From the birth of our nation, Dutch ovens have been an integral and versatile part of Americana. Sadly, today’s high-tech hustle-and-bustle lifestyle has all but forgotten the art of "leather-glove cuisine." The coal-black cast iron ovens appear outdated, unfriendly, and forbidding. If you want to learn how to use your Dutch oven, and learn some new recipes on main course meals, desserts, come and join the COFA cooking team on May 5th at 11:00 AM to 2:00 PM. Learn how to make cobbler, beef stew, ribs and other meals in your Dutch oven, just think you get sample some of these delicious meals. Do you know what to look for as you choose Dutch oven, what size Dutch oven do you need, what it means to season it or how to clean and care for it after you cook in it? Please RSVP to Mike at 303-880-9878 or mbrooks3353@gmail.com. Visit COFA's website at cofausa.org for more information on how we support families in the outdoors. Suggested donation is $15.00 for class.